A survival horror game, in which we play the role of an exorcist who fights demons not only with the power of his faith but also with countless firearms. 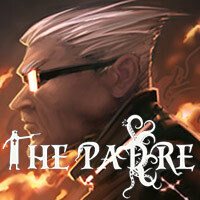 The Padre is a survival horror developed by an independent team named Shotgun with Glitters. The release of this title was taken care of by the Polish company Feardemic, whose portfolio includes, among others, the Perception game. The main character of the game is the titular Padre, an unusual exorcist who fights demons by using both his unwavering faith and firearms. When his mentor, Cardinal Benedictus, was lost without any news, the protagonist began a search that led him to an old property occupied by dark forces. The exorcist, who relies solely on himself, must examine the secrets of this home, while at the same time trying to solve the mystery of his teacher's disappearance. It is worth mentioning that despite its serious storyline, The Padre is a production full of dark humour and numerous references to pop culture. In The Padre we observe the action from predefined "film" shots. Over the course of the game we traverse through subsequent rooms of the residence and solve environmental riddles, which revolve around both manipulating various objects and searching for specific items. In addition, eliminating the nightmarish creatures that we encounter along the way plays an important role here; we dispatch them from our world by making use of melee weapons and various firearms. It is important to remain vigilant, because if our ward dies too often, he will eventually lose his life permanently, which for us means having to restart the playthrough. The three-dimensional graphics of The Padre are based on clearly visible polygons, which can evoke associations with Minecraft, among others; nevertheless, we are dealing with a title intended for mature audiences.